A sweet taste, are Sloppy Joes nice comfort food or just fast food? I don’t know, but this recipe for Sloppy Joes made in the slow cooker is a real hit! It’s time again for the food blog swap and this time I was allowed to cook from the blog of Slowfoody. 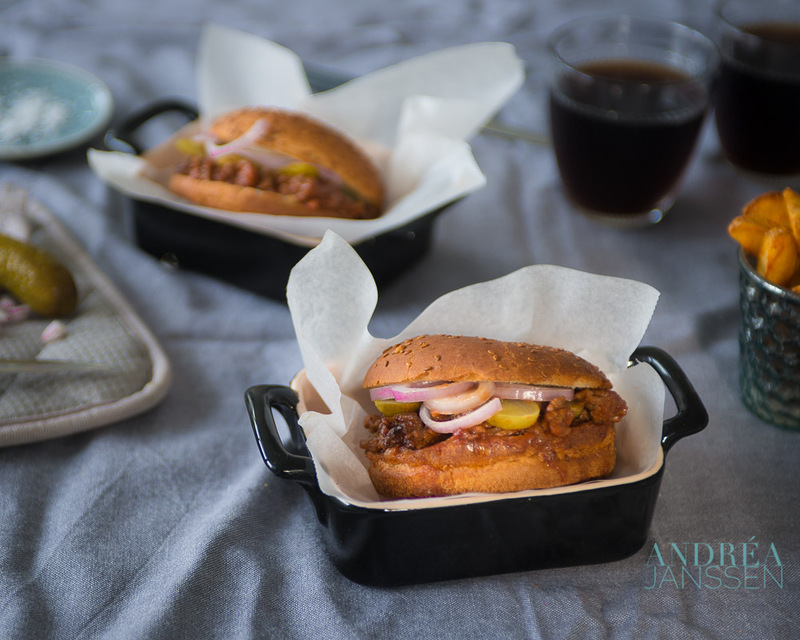 And I chose this delicious slowcooker recipe for Sloppy Joes. A stew of mince in a sweet sauce that you eat with a bun. Popular in bars and restaurants in America and with that it sure sounds like fast food, but you also have to stew it for a while so it could also fall into the comfort food category. I just don’t know for sure, but I know why it’s just so popular it tastes great. Because it was so hot I loaded my slow cooker with all the ingredients and then thrown it outdoors (not literally of course ;-). That way it stayed nice and cool inside. Because the disadvantage of cooking is your home warms up as well. And that’s fine in winter, but in the summer I look for alternatives. And if you have a power outlet outside, you can also use your slow cooker outside. As an alternative to the barbecue which I also use quite a lot these hot days. The oven and the stove are rarely used when the mercury rises above 23-24 degrees Celsius. The minced meat used for Sloppy Joes is simmered in the rich, thick sauce. On low heat for an hour or four. Further thickening is not longer necessary. Then you grab a delicious luxury hard bun or hamburger bun which you cut through the middle and you spoon a few tablespoons of the meat mixture on the bottom (the sauce then pulls delicious into the bread). Serve a crispy green salad and you’ve got a delicious meal. Enjoy your Sloppy Joes and the wonderful weather and have a very nice weekend! Heat the oil in a skillet and add the shallot and celery. Bake on medium heat for about 3 minutes. Add the minced beef and bake until it's brown. Add to the slowcooker bowl. In a separate bowl whisk the barbeque sauce, passata, worcestershire sauce, vinegar, sugar and herbs. Add the sauce to the slowcooker. Turn the slowcooker on low heat for 4 hours. Serve the Sloppy Joes on a bun with a green salad. 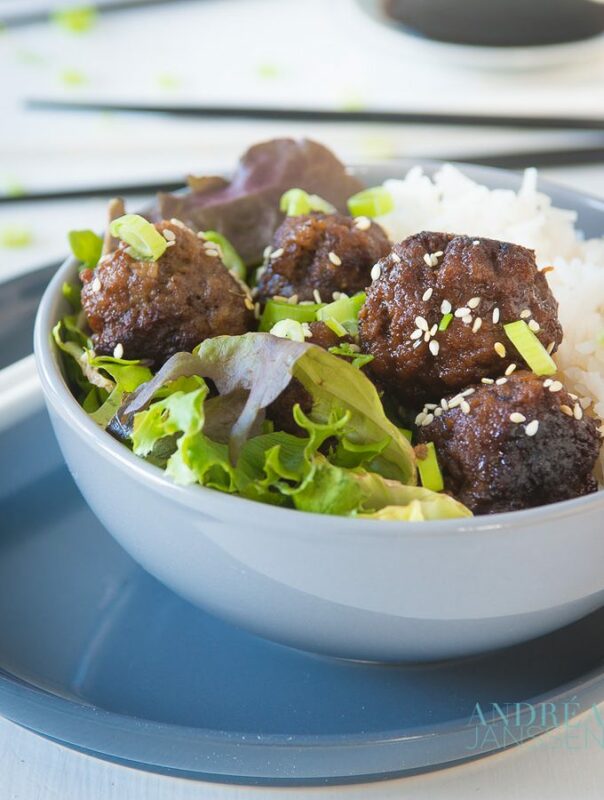 A delicious recipe for Teriyaki meatballs. 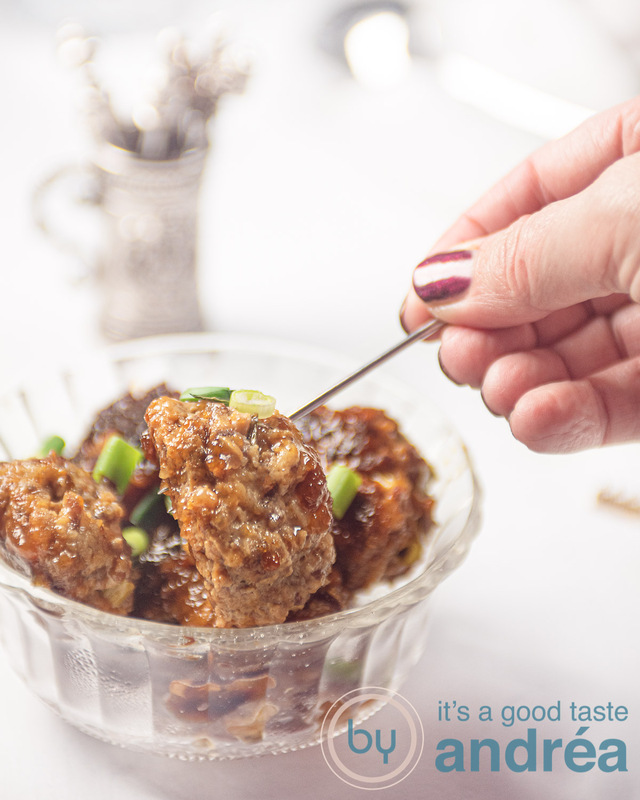 Meatballs with a Japanese touch, simmered in a sauce with soy and saké. A snack which is a winner at any party. For it was Carnival at the end of this month (and no, that’s not every year in the same week because it shifts every year). And in all the activities I hadn’t come to write this post. So that’s why on 1 March, the month when spring officially begins this delicious recipe is shared. Teriyaki is originally a Japanese recipe where you mix soy sauce with sugar, mirin (or sake). That sauce is simmered for a while, so it becomes thicker and while the meat grills or bakes, you brush it a few times with the marinade. And when you are very punctual, this recipe also not a real Teriyaki, but a delicious variation on it. Maaike used in the teriyaki sauce a ready made mix sauce and that’s something I don’t use here. So I made my own sauce because it’s actually quite simple and much tastier. Try it out yourself, you will love it! Slice the spring onions into small strips. In a bowl mix about 2 cloves of minced garlic, 2/3 of the sliced ​​spring onion, egg, breadcrumbs, salt, ground ginger, sesame oil and sweet chilli sauce. Knead until well mixed, but not too long otherwise the meat becomes firm. Roll balls of minced meat and fry quickly so it browns on all sides in oil (they don't need to be done). In a saucepan, mix the ingredients for the sauce: water, sake, the remaining garlic cloves, brown sugar and sesame oil, and bring slowly to a boil. Mix the cornstarch with a little water and pour it into the sauce. Let it boil for 1 minute until it thickens slightly and then turn off the heat. Pour the sauce on top of the meatballs, cover the pan and let the meatballs simmer for 20 to 25 minutes in the sauce. Serve the meatballs with the remaining scallions. An oriental sausage roll, minced spiced with delicious warming herbs in a crisp puff pastry envelope and sprinkled with sesame. That’s nice. Always nice when we have a new cookbook from a fellow blogger. I always want to read them. And so this book by Brenda Hoff of the blog Brenda Cooks called: fast classics with a twist was a real treat. A beautiful hardcover book, which is always super nice in the kitchen. Brenda’s writing is easy going, but that the followers of her blog obviously knew all along. What is also nice is that it are actually all familiar dishes, but slightly different. The book is divided into 10 food chapters, so you can easily find your way. From appetizer (soup) to different types of main courses, snacks, salads and desserts and cakes. Each recipe consists of two pages. A page with a photo of the recipe (always nice to already see the final result) and the other half a brief introduction, the ingredients and the recipe. And of course the cooking time and quantity. Very clear because the preparation is a numbered list, so you don’t forget when you’re cooking a recipe where you were. They are bright pictures, like Brenda’ blog, but that’s not surprising, because Brenda did all the recipe photography herself. The twist is sometimes an aha moment (as of aha of course you can) and sometimes combinations that I wouldn’t made up myself (for example, hot dogs and chicken satay and the savory turkey and pumpkin strudel). But actually every recipe sounds delicious and I want to try them out one time in the future (except the ones I naturally can’t because of my allergy). I decided right away to try one recipe if it wasn’t just delicious on paper, but whether they could stand the test in real life and I made the Oriental sausage roll. Now I can tell you that the recipe exactly meat my expectations, it was delicious. 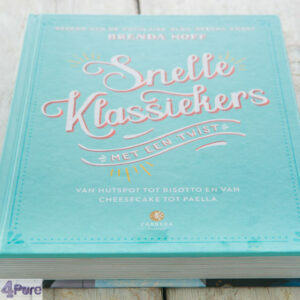 This is a great cookbook and if you can read Dutch (it’s only available in Dutch right now) I recommend you to buy it. Shepherds pie, a delicious casserole (also great to get rid of leftovers) and fast to prepare. An easy recipe for cold, freezing days. It was cold outside! Freezy weather. There was ice on the roads, but sometimes the sun came through and everything looked so much more friendly. Nevertheless it was dark outside in no time. So I got the feeling that I should make a Shepherds pie. A shepherds pie a la Andréa, because everyobody makes his own version so why shouldn’t I. And it was delicious. No scraps left. The children were content (and that’s a plus). So I will give you this delicious recipe. Dutch sausage rolls, flavorful sausage covered by a crispy bread dough. Ones tasted you know why it’s such a popular and traditional recipe in the Netherlands. The last day of the Carnival, and we celebrated that with …. sausage rolls. A traditional snack in our State. Nice and warm and easy. Of course I make them myself. That way you can taste the meat really good! And without unnatural additives, which is also great. And so you get a pure snack. And the use of ground beef makes that it doesn’t have too many calories! 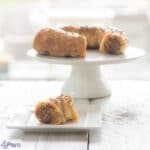 Dutch sausage rolls, flavorful sausage covered by a crispy bread dough. Ones tasted you know why it's such a popular and traditional recipe in the Netherlands. Put a pan on the stove and heat the milk and butter until the butter is melted. Allow to cool to lukewarm ( about 37 degrees ). Mix in a bowl the flour, salt and sugar. Then add the yeast, egg and milk mixture to the bowl. Mix with the dough hook for 5 minutes. If you want to knead by hand, then that's possible too. Prolong the kneading time about 5 minutes. Divide the dough into 6 pieces and make balls of them . Let stand for 10 minutes under a cloth. Meanwhile put, in a second bowl all the ingredients for the meat and mix well. Divide the meat mixture into six and make a role of every part equal thickness and length. Grab a ball of dough and roll it thinly with a rolling pin. The dough piece must have the size that the meat roll can easily fold inside. Then put the meat roll on it and brush the edge of the dough with the egg yolk. Fold the top and bottom (narrow sides of the meat roll) inward and then fold the other two sides, facing each other. Press the seam tight. Place the buns seam side down on the baking sheet. Repeat for all six rolls. Cover the rolls and let rise for 1 hour. Pre-heat the oven in the last 10 minutes to 200 degrees Celsius . Brush the top of the rolls with the egg mixture and slide the baking plate in the oven. 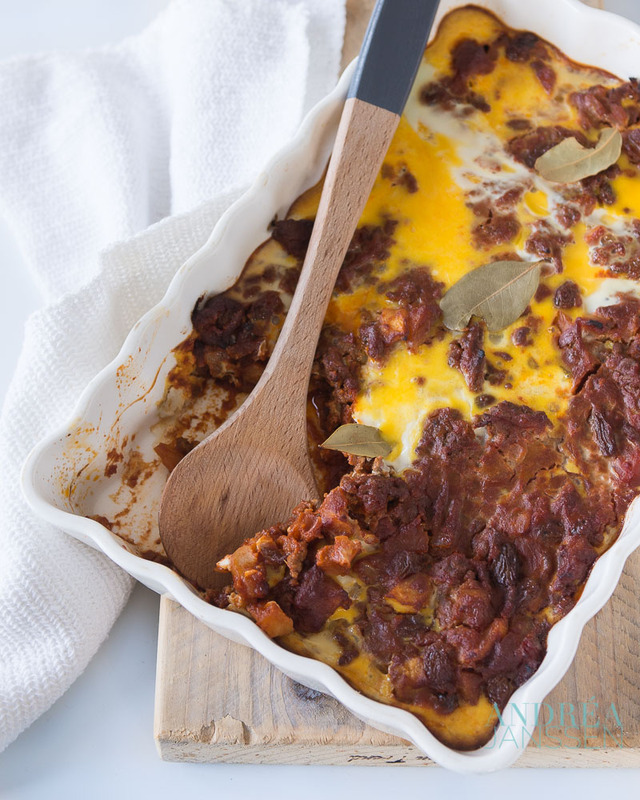 Enchilada, Mexican delight, can be turned into a casserole easily. And because you make it from scratch it’s budget friendly. Including video recipe. Enchilada is a delicious recipe, which is budget friendly. And you can easily prepare it from scratch. That also counts for the enchilada sauce. Combining those will give you a great low cost recipe with great flavor. 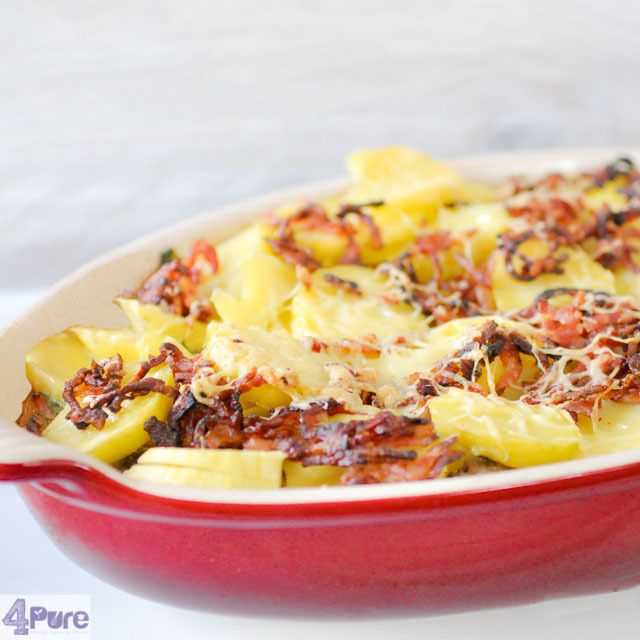 And this time I added a video to show how easy it is to prepare this casserole. Enchilada, Mexican delight, can be turned into a casserole easily. And because you make it from scratch it's budget friendly. Including video recipe. Bake the beef until it's brown in a frying pan. Mix the beef with the sauce. Put 2 tortilla's in the casserole. Add 1/3 sauce and spread on top of the tortilla's. Top that with 2 tortilla's. Again add 1/3 sauce, remaining corn kernels and 1/3 of the sauce on top of the tortilla's. End by putting the leftover tortilla's on the sauce. Spoon the remaining sauce on the tortilla en sprinkle everything with the rest of the cheese. 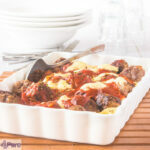 An easy meal, this recipe for a meatball casserole with pasta. Quick and can be preprepared. You have to try this one out yourself! An easy dinner this meatloaf casserole with tagliatelle. You’ve just have to fry the meatballs slightly, cook the tagliatelle for a couple of minutes (just so it becomes soft, because they will be cooked in the sauce) and prepare a quick tomato sauce. 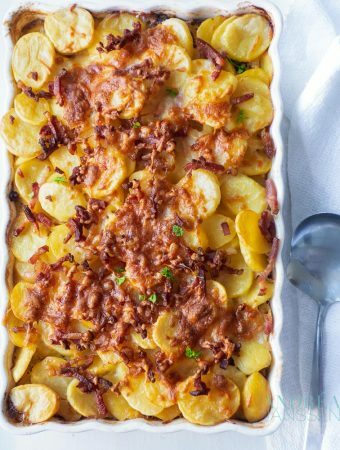 Pour everything in the casserole dish and in 20 minutes you’ve got a delicious meal. You can also prepare this the night before and store it in the refrigerator until you’re ready to bake it the next day. Bring a pan with water to the boil, put in the pasta and when it becomes soft, take it out. Put the pasta in the casserole dish. Put the minced meat in a bowl and add the garlic, eggs, breadcrumbs, cheese, salt, pepper and 1 tablespoon Italian herbs. Knead until everything is incorporated. Heat the oil in a frying pan and melt the butter in it. Bake them in the butter-oil mixture until brown. Spread the meatballs on top of the tagliatelle in the casserole. In the same frying pan bake the onion for about 3 minutes on low heat. Add the sieved tomatoes, sugar and the rest of the herbs. Pour the sauce over the meatloaf and make sure the tomato sauce is spread on top of the tagliatelle. Slice the mozzarella in small pieces and spread them on top of the dish. Put the casserole in the oven and bake for 20 minutes. This recipe for a savory bread meatloaf with video is delicious. 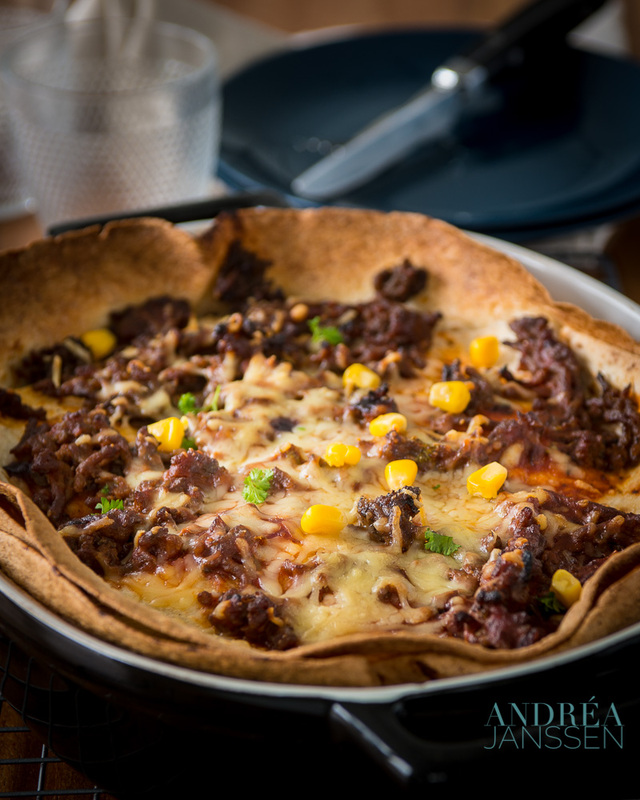 Eat it at Sunday brunch, but it’s also very delicious with Sinterklaas or Christmas. Again a recipe video (with moving images, I’m stil work in progress :-)), because you gave such a great response on the first video. This time a recipe for a savory bread meatloaf which, as you can see in the video, isn’t all that hard to make. Anyone can bake this. And of course I also add the recipe as a print version, so you can read it and save it in your recipe box. Have a great baking time! 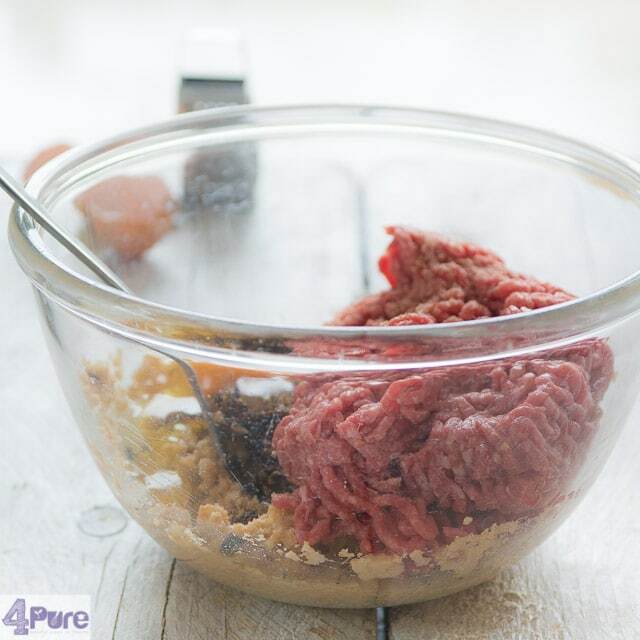 Mix the onion mixture with the breadcrumbs, minced beef and egg. 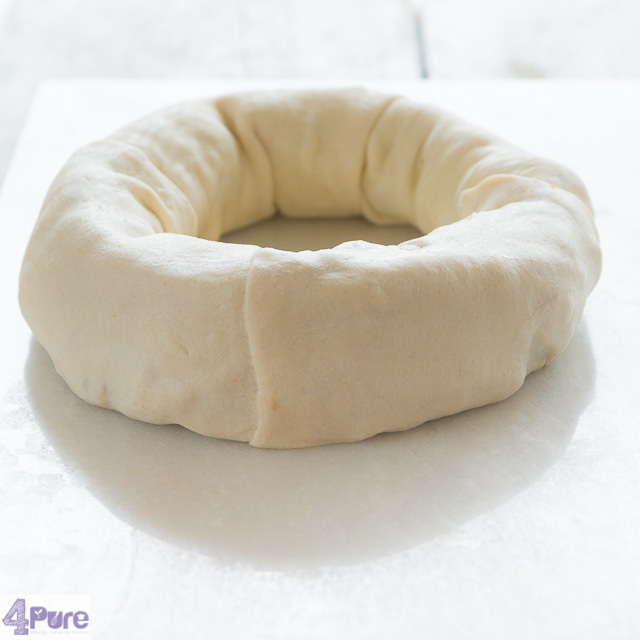 Make a roll of the meat (about 40 cm) and place that on the puff pastry. Form a circle of the pastry. Close the circle and press the seem with your thumbs tightly. If you need inspiration for the weekly menu of this week, don’t look further. Hereby a delicious menu for dinner this week and even a delicious dessert for the weekend. Can be pre prepared on Sunday, so ideal to start the week with this delicious chicken broccoli casserole! 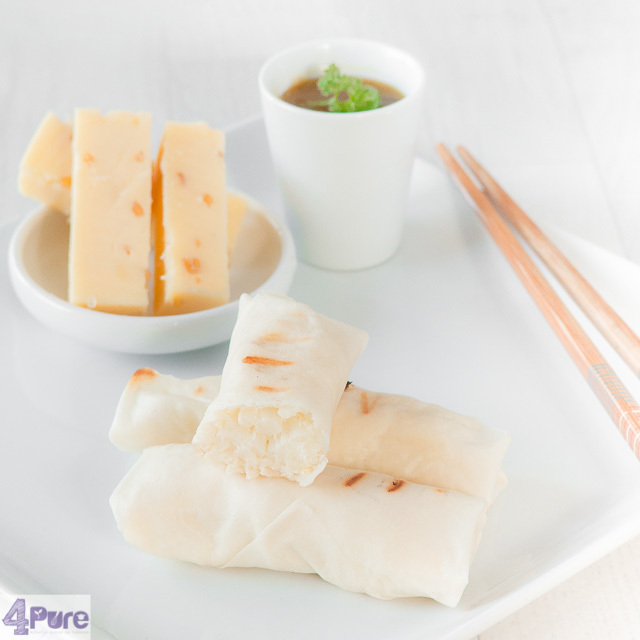 Lumpia, the vegetarian way, with cauliflower, cheese and spices. Delicious when served with a salad. Bobotie is spicy, fresh and aromatic. 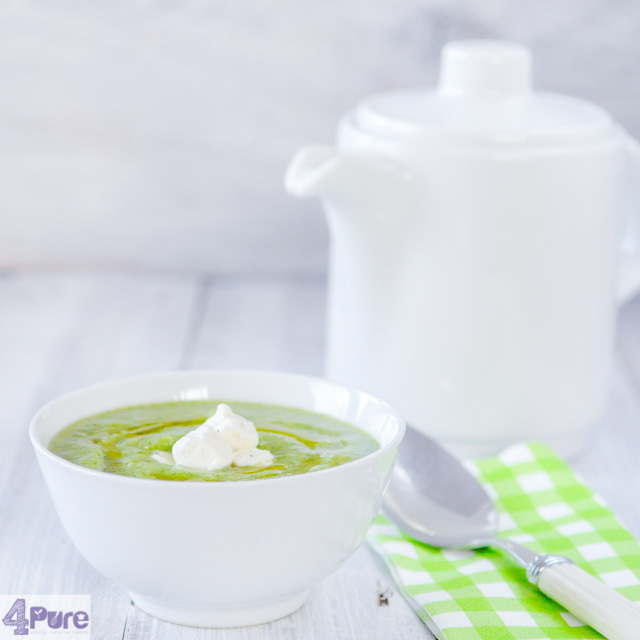 A delicious recipe for autumn when the weather gets colder. Bobotie is a recipe that originated in South Africa. But did you know that it’s probably a derivative of a curry dish recipe that was made in Indonesia and what ended up in South Africa via the VOC (Dutch East India Company). This Is all of course a long time ago so their is no way to tell if this story is right. From South Africa this recipe spreaded throughout Africa but also to South America. In any case it is recognized by the United Nations in 1951 as a traditional South African dish and included in their international recipe book. For me Bobotie is a delicious stew in the fall. For The spices are warming, the apples tasty sweet and combine well with the savory meat and eggs. And not only the taste is delicious, even the smell is great. When you make Bobotie, your whole house will get a wonderful scent. I’m not originally South African, nor my family so my recipe is a blend of several recipes that I found on the web and I adapted them to my own taste. You love a crunch also add some almonds or walnuts. In the morning you can prepare the meat with the spices and simmer until done. Spoon it into the oven dish and store it until use in the refrigeratore. You only have to pour the egg mixture on top and the Bobotie is ready for the oven. Bobotie should be eaten immediately. Put the raisins and apricots 10 minutes in hot water. Drain, let them cool and cut the apricots into thin strips. Chop the onion and fry it on low heat (about 3 minutes) in some oil. Meanwhile, peel the apple and cut into small cubes. Add the paprika, ginger powder, pinch of cayenne pepper, Worcestershire sauce, brown sugar, tomato paste, diced apple, apricot slices and plum tomatoes to this. Bring to a boil and simmer 3 to 5 minutes. Put the meat in the mixture and bake it until brown. 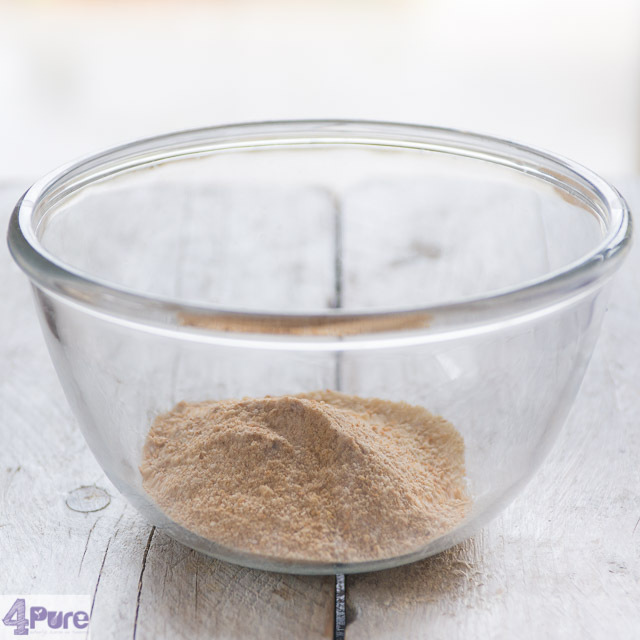 Put the bread crumbs and 2 tablespoons milk into the mixture, mix and simmer 30 minutes. Spoon into an ovenproof dish. Grab the eggs, whisk them with the milk and pour it over the meat mixture so everything is well coated. Place the bay leaves on top and put the dish in the oven. Bake for 20 minutes until the egg is well solidified. This delicious dish is easy to prepare. Creamy endive with cheese flavor, then a nice layer of sweet minced meat topped with sliced potatoes. Sprinkled with some bacon topping and more cheese. A delicious combination that we probably eat more often! The endive is in season. We often eat it as a raw endive hotchpot. Nice of course, but when I was surfing across the internet I was inspired to make a casserole. Of course I had to try it out (and adapt it to my own taste). The casserole was delicious. 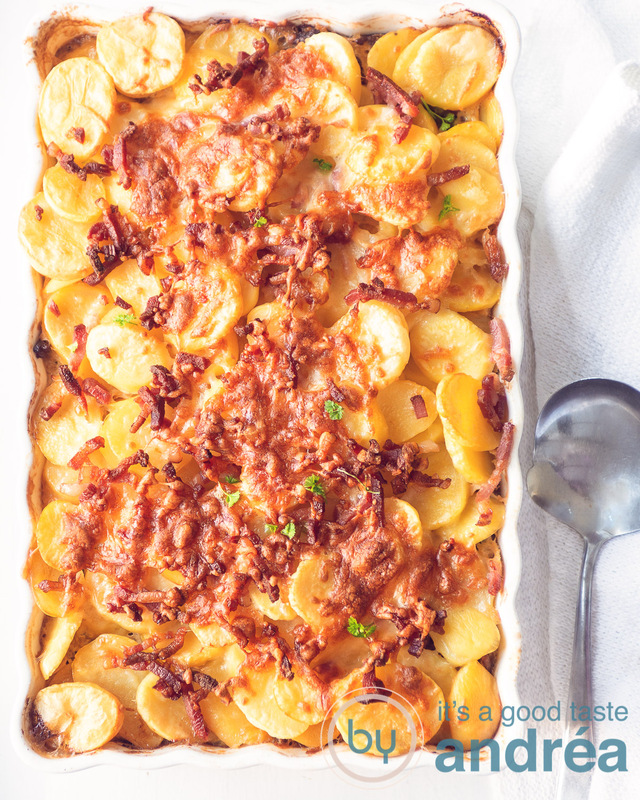 A nice layer of creamy andive with cheese flavor, the second layer sweet minced meat topped with sliced potatoes. On top bacon and even more cheese were sprinkled. A delicious combination that we will definitely eat more often! You boil the potatoes just 10 minutes, they are al dente. This is important because in the oven they will cook further. This way you get a crispy crust and a soft inside. you have limited time, so make this dish the day before and just put it in the oven on cooking day cooling. you add bacon, don’t add salt when cooking the potatoes, it will be flavored enough. Slice the endive very small and wash it very well. Peel the potatoes and cut them into slices. Boil the potatoes 10 minutes in boiling water until they are done. Drain and let slightly cool. Mix the meat with the soy sauce. 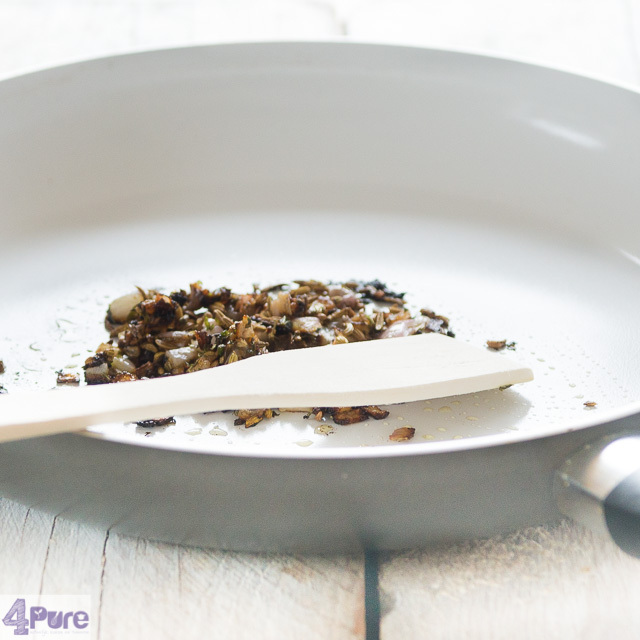 Heat 1 tablespoon oil in a frying pan and fry the minced beef. Remove the meat from the pan and keep aside. Put the endive in the hot frying pan (with some water ) and stir briefly. Then put the lid on the pan and let simmer for 5 minutes. Meanwhile, mix in a bowl the creme fraiche, 4 eggs and 3/4 of the grated cheese. Remove the endive from the heat and stir in the creme fraiche mixture. In the baking dish put the endive as the first layer. Spread the meat on top of the endive. Cover it with the slices potato. Sprinkle with the bacon and remaining cheese. Place the dish in the oven and bake for 35 minutes. 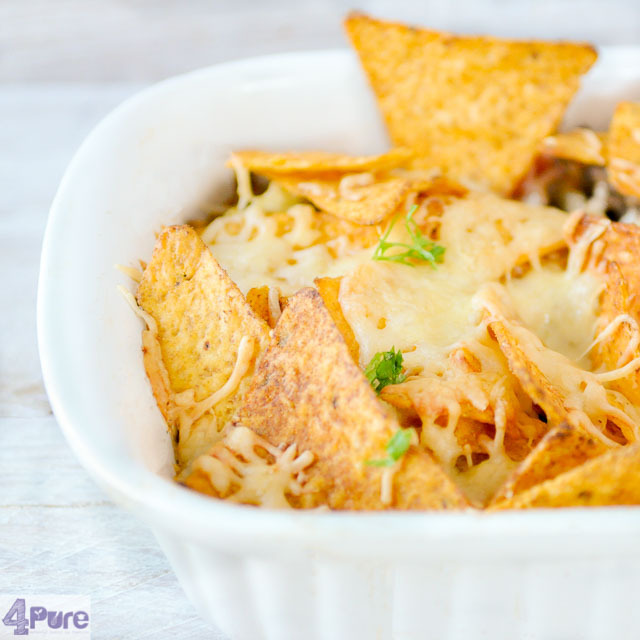 This recipe for Mexican nacho casserole gives a deliciously creamy sauce with vegetables and ground beef topped with crunchy nacho chips. Super Simple and easy. 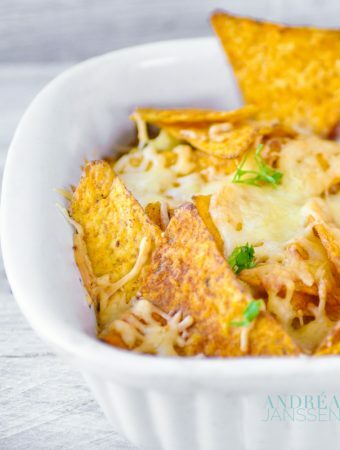 Today a delicious Mexican nacho casserole. Not with paprika. No, if I call paprika my three kids run very hard away and they only come back after dinner. A sort of hereditary family tock I guess, because we as parents aren’t fond of it either. No, this dish I’ve adapted to the vegetables that we like. Then I flavored it with a homemade taco seasoning. 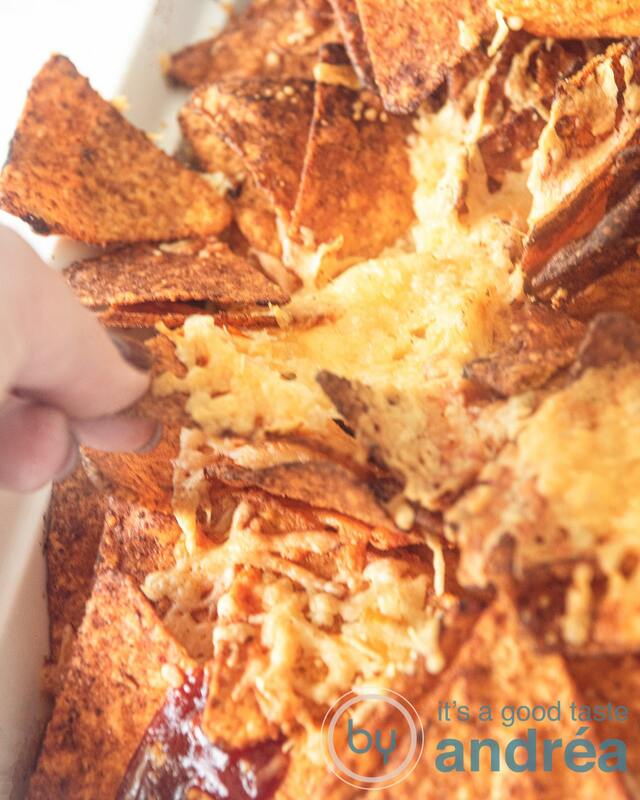 And topped it with sour cream, nacho chips and grated cheese. Then in the oven and on the table and then the dish was empty. Nada, zilch, nothing more! Mix the spices and sugar together and mix with the ground beef. Fruit the onion in a little oil in a frying pan for about 5 minutes on low heat . Add the beef and fry the minced beef. When the meat is brown, add the vegetables (tomatoes, peas and cabbage) and stir fry for 4 minutes. Put this mixture in a oven dish. Spread the creme fraiche over the meat. Lay the tortilla chips on top. Slide the tray into the oven for 20 minutes.